Magnolias and Men M/M Romance With a Southern Accent: Release Day! 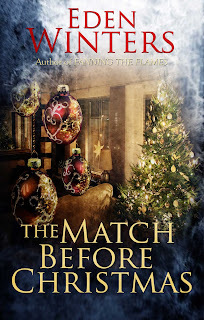 I'm very pleased to announce that The Match Before Christmas 2nd Edition is now available at All Romance Ebooks and Amazon. And it's got a great new cover, courtesy of Jared Rackler from Jared Rackler Designs. Join lonely building contractor Barry Richards as he navigates the (sometime frightening) maze of online dating. Barry admired the festive holly wreath hanging from his parent’s front door, while deciding how to knock with one arm laden with brightly wrapped packages and the other around a smiling man. The family was going to love his new boyfriend. A car door slamming in the neighbor’s drive brought him out of his daydream. Barry sighed for about the hundredth time since getting his parent’s e-mail. Was it too much to ask to have, just once, the kind of Christmas he’d always dreamed about? But that’s what it was, a dream. His parents’ holiday cruise plans laid waste to Barry and his sister’s annual Yule pilgrimage to Mom and Dad’s. Karen immediately invited him to spend Christmas at her house. “We’ll make a new tradition,” she’d said. While his sister’s family would love to have him there, Barry wanted someone of his own to spend the joyous occasion, and ultimately life, with. He wasn’t pouting. Not at all. The entire situation underscored his loneliness. Mom and Dad had each other, Karen had Jack and the kids, he had nobody—yet. Barry’s was a simple goal, to find someone special by Christmas, three months away, even if he wouldn’t be introducing the as yet unnamed man to his folks this year. Single, reasonably attractive gay man, looking for same for possible long-term relationship. Interests: museums, the arts, sports, pets, and romantic candlelit dinners. Muttering, “I’m a loser,” under his breath, Barry double-checked all the questionnaire boxes he’d clicked previously, making a few minor adjustments here and there. He paused at the question: “Desired Ages?” While he wanted a stable adult in his life, starting too high might discourage some earnest recent college grad. Likewise, ending too low might exclude the doctor of his dreams for having had a recent birthday. Knowing the criteria could be changed later prompted him to select “Between twenty-five and thirty-five.” Race and religious preferences he left open. He listed his own as Christian, due to the vague memory of a few Sunday school classes in his youth. Though he’d always been a bit camera shy, resulting in very few available likenesses, he found several group pictures on his hard drive and attempted to edit all the other subjects out. He discarded the results one by one until he came across a recent photo his secretary had taken at the office. He didn’t usually photograph well, in his opinion, but he wasn’t too ashamed of this one. His clear green eyes stood out, thanks to a slightly darker green shirt, and his normally unruly auburn hair framed his face nicely, falling in loose waves. To him, the photo portrayed a successful businessman, which he was, but also showed a more casual side of his personality. “Present yourself as well-rounded,” the site advised. Before he had a chance to overthink the situation and change his mind, he hit the big red “Enter” button. There went nothing. If things went well, Barry fully believed he’d spent his last lonely weekend. If they didn’t, he was only out fifty bucks, and the cats didn’t lose a lap to sit in for the few hours it would take to go on a date. Thanks. Yeah, it was on the calendar for a few weeks ago, but kept slipping and slipping. Done now! Dang. I should have waited and done a giveaway on your site, shouldn't I? Sigh. Sorry.